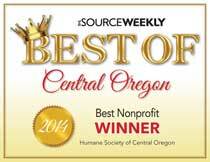 Thank you for your generous donation to Humane Society of Central Oregon! Your gift helps over 4000 animals that pass through our shelter, gives us the opportunity to continue our Education Outreach and more! Again, we thank you!